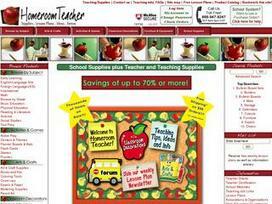 Homeroom Teacher Supplies is an online store providing school supplies, teacher resources, and educational information. A huge variety is available here, and the different categories are activities and games, arts and crafts, classroom decorations, furniture and equipment, school supplies, and books. Each product ensures the best possible quality. Each of the mentioned categories further offers you a wide range. In the activities and games category of Homeroom Teacher Supplies you can choose from active play, activity books, centers and themes, flash cards, learning games, puzzles, and lots more. The children are sure to enjoy themselves while playing these games, and while playing they are going to learn a lot. In the classroom decoration category you can select from bulletin board sets, calendar sets cut-outs, alphabets and numbers, posters and charts, and so on. These help to make the classroom look livelier and more inviting for the children. Homeroom Teacher Supplies also provides essential school materials such as crayons, maps, arts and crafts, papers, colored makers, etc. This website is a learning forum as well as a playing forum for children going to school. Teachers believe that introducing educational games can create added interest in the mind of a child. Keeping this in mind, you can secure your child's future with some of the most exciting games featured here. Homeroom Teacher Supplies also features furniture for decorating your classrooms. In the math category you can choose from addition and subtraction, algebra and pre-algebra, base 10 and place value, multiplication and division, and lots more. These are going to help your child excel in the various dimensions of math. In the science category you can opt from biology, chemistry, human anatomy, physics, health and nutrition, and more. This helps your child to have a better understanding of the various science streams in an uncomplicated manner. Different types of boards are available at Homeroom Teacher Supplies. Bulletin boards and corkboards, chalkboards, dry erase and marker boards, and small boards and accessories are some of them. An efficient host of customer care executives awaits the opportunity to help the customers with their queries. They can be contacted via phone, mail, or email. The privacy and security of every customer is strictly protected at Homeroom Teacher Supplies. No information provided here will be shared elsewhere. This website is user-friendly and focuses on the soul objective of "Maximizing the Potential to Educate." It strives to provide you with the best possible products. If, however, any customer is not completely satisfied with any of the products, he or she can have it exchanged or ask for a refund, within a stipulated time. Share what you think about Homeroom Teacher Supplies, and your favorite ways to save there!